this morning the boys got to attend a birthday party at a friend's house. 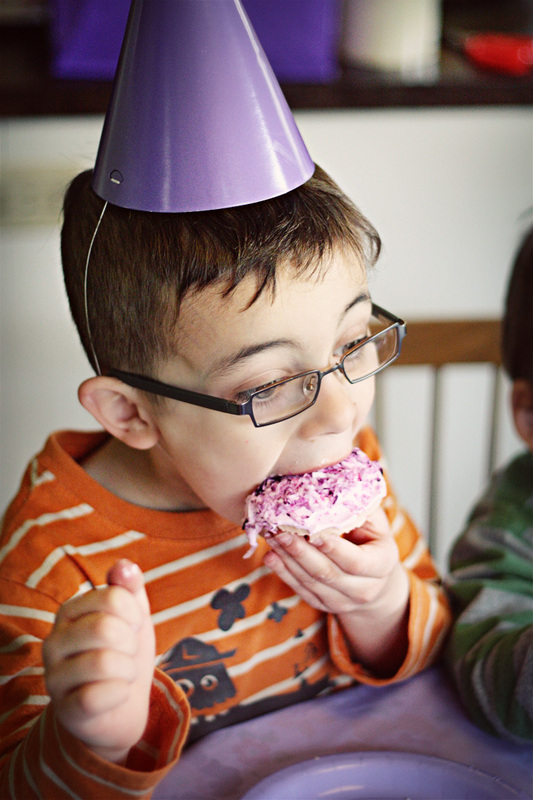 what strikes me in this photo is that it doesn't matter that the party was for a 3 year old little girl wearing a purple tutu, or that he was a boy eating a purple cupcake off of a purple plate while wearing a purple birthday hat. i love that. when you're a kid, none of those stereotypes matter....there are no girl or boy colors. all that matters are the cupcakes and the friends. I always make sure my hat matches my donut. the banner looks good. sweet photos. april 30, 2010 :: choo! in other news :: no more braces! in other news :: vote for my new header!